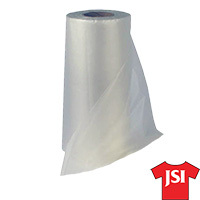 Premium quality JSI Water Soluble Embroidery Topping and stabilizer prevents stitches from sinking into plush and textured fabrics and is easily washed away with water. From Pamela Howell of Vienna, West Virginia on 12/21/2017 . And nice quantity! I'm keeping this roll in a zip lock bag to keep it nice and soft...so it won't dehydrate! Ha! 2.0 oz Stick-N-Wash Water Soluble Adhesive Backing - 500 Ct 8" x 8" Badgemaster Water Soluble Film - 15" x 50 yard roll JSI Water Soluble Topping - 500 Ct 8" x 8"